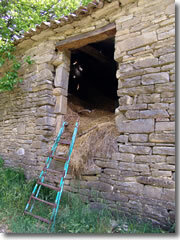 An outbuilding on the farm of Gologori?ki DolGologorički Dol—where Slavko Stojšić rhapsodized about Istria in the half-light of his wine cellar—was a clutch of stone buildings at the end of a dirt road that wound past vineyards and a stream beside which grazed horses, goats, cattle, and one very noisy donkey. It's a working farm (before you book, remember: you can't hit the snooze button on a rooster), and they don't seem to realize the overkill of feeding their guests the same hearty, rib-sticking meals they do their farmhands. They don't let up at breakfast, either. While Slavko and his early-rising gaggle of cousins and farm workers washed down lunch rations with beer and rakija at one end of the long picnic table, his sister-in-law Marlena sat me at the other end and provided a plate piled high with scrambled eggs—studded with chunks of cheese and thick strips of what must have been half a pršut hamhocks—accompanied by strong coffee and amazing fried dough rings called peka. They were delicious, they were clearly quite bad for you, and I insisted Marlena stop bringing them to me after the second basketful. 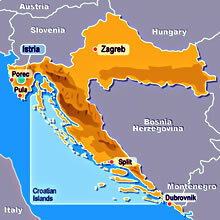 I worked off some of Gologorički Dol's bounty by exploring the hilltowns of the interior. 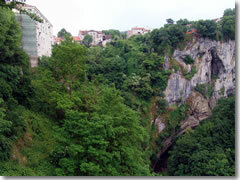 The gorge of PazinThe provincial capital of Pazin is an oversized cow town with a 10th century castle sprawled along the lip of a gorge slashing right though the center of town, animated by the distant roar of the unseen river in the gorge floor rushing into a hole under the cliff to become an underground stream. This dramatic setting featured in Mathias Sandorf, a minor novel by Jules Verne—the eponymous hero escapes one of many predicaments by plunging from the castle, down the cliff, and into the river, which carries him away underground. The town now proudly has a Jules Verne Club which celebrates Jules Verne Day (June 26), and the street leading to the castle has been named "ulica Julsa Verna." Trg Josefa Ressela 1, tel. +385-(0)52-617-480, www.istria-motovun.comLofty Motovun, its mighty walls encircling a hilltop, is picture-perfect from afar, but packed with souvenir shops and tour bus hordes once you get there. This is the hilltown that tour buses hit, and the locals charge 15kn just to park by the side of the road leading up to town. MotovunI counted 11 souvenir shops offering rakija and olive oil tastings and six bars and restaurants along the single street curving up through the town gate into the main square. As for people, there were far too many to count. After the obligatory circuit atop the city walls, walking the old soldiers' path and drinking in the sweeping views of an Istrian panorama all around, I dashed through the pretty (but packed) main square, dodged between an Italian and a German tour group, and escaped into the quiet of Konoba Pod Voltom. Inside this little cafe, installed in the medieval city gate, I grabbed a table by the bar to sip a Favorit beer surrounded by a clutch of local women watching a Croatian soap opera set in the Renaissance. Umberto Gorjan 3, tel. 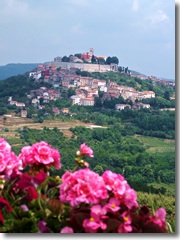 +385-(0)52-776-131, www.istria-groznjan.comGrožnjan was far less afflicted by sprawl and souvenirs, and quite a sight calmer. However, despite the gorgeous valley views and squeaky-clean medieval streets, there was something creepy about a town with only 80 residents but 40 art galleries and studios—several years ago, the government arranged for artists to take over the nearly abandoned town. I hear it's quite lively during the big August music festival, but I wanted someplace a little less commercial and a little more genuine, so I set off in search of frescoes. As is usually the case, it was the smaller towns barely mentioned in the guidebooks (if at all) that proved the most rewarding. 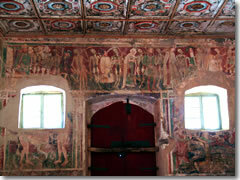 The Dance of Death fresco in Beram's Church of St. Mary of the Rocks.Every village in the Istrian interior seems to have a chapel just outside town that is swathed inside with colorful floor-to-ceiling medieval frescoes. I Beram I also learned that if you want to see these frescoed chapels, you need to find the person with the key, or ključ, pronounced klee-yooch. In Beram the keymaster is Sonja, who lives at #38 on the town square and is not shy about dropping hints regarding tips. Knowing this came in handy by the time I got to medieval hamlet of Draguć, where cats appeared to outnumber people by a factor of three to one. I parked on the main square of Draguć next to the bell tower, marched past a trio of old men sitting on a ledge, and asked the two women lounging at picnic tables outside the lone bar/restaurant "Ključ Sveti Roka?" 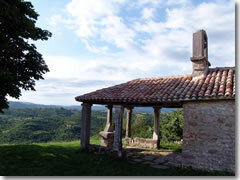 The chapel of Sveti Roka outside the tiny hamlet of Draguc.They pointed to a nearby door, so I went over to knock. The tapping echoed around the dining room I could see through the window, but there was no answer. I knocked again, harder, and called out "Dobar Dan?" (Hello?) Nothing. I began to wander away when one of the old men jumped up and waved me back over, joining me at the door. He opened it up and bellowed something into the dark interior. There was a scraping noise from upstairs followed by a wavering crackle of a voice. He hollered again, and I heard the words Sveti Roka. He smiled at me and hustled back to his spot on the ledge to continue watching me. Eventually an ancient woman who couldn't have been more than four feet tall emerged with a big, watery smile. I asked her for the ključ to the chapel of Sveti Roka, and she disappeared, reemerging with a giant skeleton key and a pantomimed admonishment to be sure I locked the door behind me. I waved the ključ triumphantly as I passed the three men, and they waved back; then they and the women at the bar all pointed to an arch between two buildings I probably would never have tried in my search for the church. 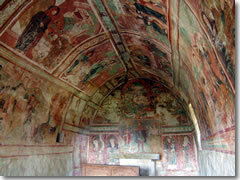 The frescoes inside the Sveti Roka chapel of Draguć.The lane beyond led past stony houses to a promontory with a 300-degree panorama over the valley below. Set just back from the lip was a miniscule church, its porch positioned for the view. I wrestled the giant key into the lock, stepped inside, and found myself surrounded by floor to ceiling frescoes—shopworn and sun-faded in places, with graffiti scratched into much of it, but still spectacular. There were scenes from the Passion, the Massacre of the Innocents, and the Baptism of Christ all populated by local people in medieval garb, an Annunciation featuring a big white dog, and a Technicolor Trinity. The Draguć keymaster didn't answer when I returned to the village square, which was now empty, but her door was still wide open, so I crept inside, placed the key on her dining room table, and retired to the bar for a celebratory espresso. I had one hilltown left to go: Hum, its name and size as tiny as its claim to fame was huge: Hum is ranked as the smallest town in the entire world. This article was last updated in May, 2009, when a version of it appeared in Budget Travel magazine. All information was accurate at the time.